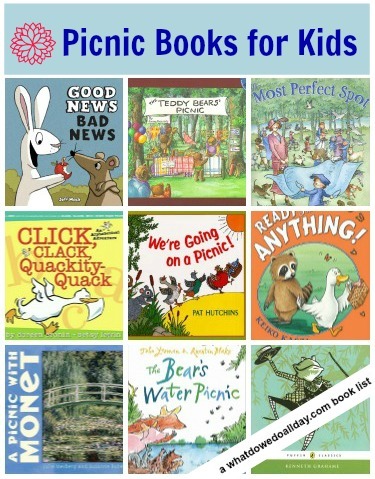 Picnic books are lots of fun to read during the summer months when eating al fresco is on the agenda. During the hot summer months we spend as much time away from the apartment as possible. I simply cannot stand to be inside with two rowdy, fighting boys for any length of time. This necessitates a lot of picnics in the park. And what goes well with a basket of food on the grass? Why, picnic books for kids of course. Take a look at some that we’ve been reading. We’re Going on a Picnic! . This is by the author of two of my favorite children’s books of all time (Rosie’s Walk and Good-Night, Owl! ). I only just discovered this one but it’s now one of New Kid’s favorites. Sneaky little woodland creatures manage to outwit the farmyard animals on a picnic quest, but all in the name of good fun and a few giggles. My three year old can relate to any book with mischievous characters. Ah-hem. Click, Clack, Quackity-Quack: An Alphabetical Adventure . It takes a barnyard and an alphabet to get ready for a picnic! Ready for Anything! . Smart picnickers come prepared! This is a funny tale in which Raccoon imagines all sorts of disastrous scenarios, but his best friend Duck is able to set his mind to rest. Teddy Bears’ Picnic . There are a number of versions of this classic and nostalgic poem. I think this is one of the better illustrated ones. The Bear’s Water Picnic . Don’t underestimate the usefulness of froggy friends! When things go wrong at a picnic, frogs and friends sort things out so everyone can have a good time. A Picnic with Monet . This lovely board book tells the story of a countryside picnic through the paintings of Monet. My little guy kids loves the rhyming text. Good News, Bad News . The two title phrases are used interchangeably to tell the story of a picnic full of ups and downs. Young kids will love chiming in with the text. A delight. The Most Perfect Spot . Take a look to see if your library has a copy of this book. You won’t be sorry to read this funny, old-fashioned tale. Every picnicker understands how important it is to find just the right spot for the picnic blanket. Goode’s illustrations are perfectly charming. The Wind in the Willows . Even if your children are not able to sit for the whole book, you can still go for a picnic with Mole and Rat. Be sure to tote along an illustrated version so even if you are picnicking on the fire escape, kids can still stare at idyllic scenes while they listen. My personal favorite picnic scene in literature, however, has got to be in Emma. Fancy a trip to Box Hill, anyone? Will you be going on a lot of picnics this season? So, you like awkward, tension-filled, snarky picnics? Only three dull things at once, now! Snarky is my middle name, and I am always awkward, which causes a lot of tension. Great list of books! Now you have me wanting to have a picnic. With this heat and humidity, though, we may have to wait until October! Great list of books. Wind in the Willows is on my list to read with Anna. Thanks for joining WMCIR!